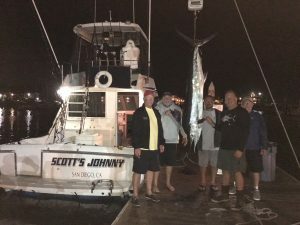 I would also like to Congratulate Captain Mike Bratton and Crew of “SCOTTS JOHNNY” – Jeff Behr, Jeff Steinhardt, Clayton Dumsdorf, and Dan Bailey on their Captured Marlin 130.6 lbs. and another successful Released Marlin. Although the fish could not be entered do to a time constraint – it was an impressive feat, both fish fought by angler Jeff Behr and is the current Fish of the Month Leader. Special Thanks to Jeff Behr for Donating the $500 Cash Prize for the Tuna Division. 2nd Prize winner by drawing was awarded to Justin Wood aboard “FIRE ESCAPE” Captain Jeff Zachry and crew member Mike Jones.